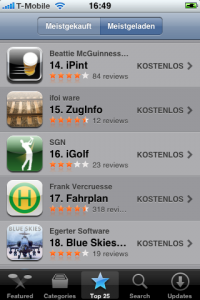 I got a little scared today when I browsed through the AppStore and found ZugInfo on position 15 of the most downloaded Apps, just beaten by the IPint. First: Thanks folks, for all the downloading. I hope you enjoy. many people seem to enjoy this application. Maybe you could provide a stable web API, so I don’t have to live in fear of the day, you decide to change your website and break it. PS: I never actually checked, if there is an accessible stable web API to the Fahrplanauskunft. If anyone knows of such thing, please feel free to enlighten me in the comment section. Ones upon a time in the 90′ painting the walls in your shared apartment in bright colors was the chic. Especially in warm orange applied with sponges, or other seafood. We moved in a new apartment at the beginning of the 00′ and there was still some 90′ air lingering around, so our bathroom ended up orange, nicely matched with pink accessories. It already felt odd add that time, and all other rooms got the 00â€˜ white cube look. But now, it’s over. Really, it is over. So using a beautiful summer day of my holidays I took on the challenge to timewarp out bathroom to the 00′. Turns out the 90′ are pretty persistent. I post an update after the second layer. Sidenote on summer in northern Germany: As for the inuits with white and snow, the northern Germans should have an extended vocabulary for grey and sky.